JA T3 Framework is the third generation template framework developed by JoomlArt for Joomla! 1.5 and above and brings new improvements and features: a new structure, Layouts, Mobile Ready, Right to Left Language Support and a powerful menu system called Mega Menu. The framework itself is our five years experience providing templates for Joomla!, it was developed to shorten the website development. JA T3 Framework 2.0 is a new version template framework introducing new features: profiles, plugins, themes. The new framework also comes with a new structure: a light template, a plugin to hold the default design and core scripts, a plugin to manage the template typography, but the plugin to hold menu parameters for Mega Menu have been integrated into the core framework plugin to make the updating easier. JA T3 Blank Template is a new clean template design powered by the new framework. 2. To avoid compatibility issues, the plugin for Joomla! 1.7 and the one for Joomla! 1.5 will be supplied separately as independent plugins. 4. The framework was developed with Joomla! 1.7 vision in mind (at the time of the JA T3 Framework 2.0 was developed, there was Joomla! 1.7 Alpha) so now we have a chance to see how the framework would fit and make the most use of Joomla! 1.7. Also, we develop the framework in a way that users wont have to make many changes to our template when they upgrade their websites to Joomla! 1.7. 5. Our framework is based on semantic HTML/CSS skeleton which is used by both versions for Joomla! 1.5 and for Joomla! 1.7. Introducing Profiles - a new presets feature to control template design and other template settings. The template administration panel comes with a new look, split into several sections and is AJAX powered. Modular code makes the template light and fast but also powerful. Scripts that are not used, are not loaded! New performance features: template cache and CSS&JS compression. Now the framework support advanced override features to develop a flexible front-end design, user friendly! The new framework comes with a new structure - meet the new plugins to take over the framework functions! text direction switcher - allows users to change the text direction of the website. An advanced navigation system upgraded by the Mega Menu, a new menu system to improve the other menu systems by giving them additional class and menu item description or slogan line, but also upgraded the template functions by adding the override capabilities made possible now with the new Profiles feature. Multiple layout system - index.php no longer hold module positions, layouts do! These layouts are files to manage HTML generating scripts and are built with blocks having distinctive styling, functions and module positions. 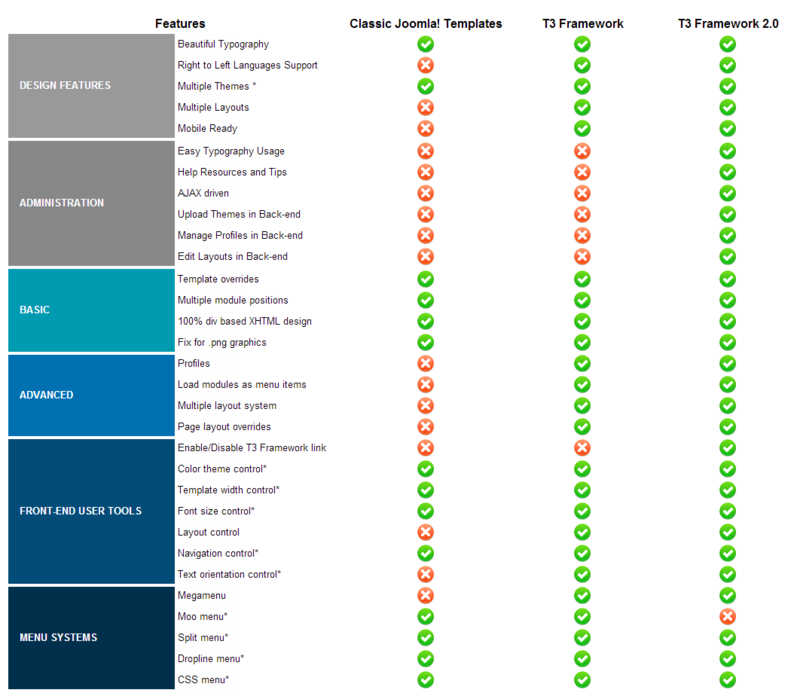 The new T3 framework is different than the classic framework. Any usual template has the capability to manage module positions and styling classes, manage overrides, detect user's browser client, interact with the user in a certain manner, and others can give a user the freedom to chose from multiple colors or font sizes, but they all have the same structure. * The original JA Purity is one of the classical templates that support some of the features built in the T3 Framework. The new T3 framework will add more freedom to the end user by letting him chose the navigation type and layout that he likes the most. You will be able to create a single layout or multiple layouts exactly how your users want. The T3 framework will successfully upgrade the way you develop. You can now create a full control panel for your users to customize the web interface like never before. JA T3 Framework is free and you can download it here for Joomla! 1.5 and here for Joomla! 1.7. Whenever you need a hand developing with T3 Framework 2.0, feel free to ask for support in our forum. Members have access to professional help, and can submit support tickets online via support portal and our support team will provide assistance in less than 12 hours! No account yet? Subscribe here!